Kapil Mishra had alleged "massive irregularities" in the funding of AAP and raised questions about the "suspicious" donation of Rs 2 crore. He had also claimed that several shell companies had given money to AAP and the party knew it. Kapil Mishra had alleged "massive irregularities" in funding of AAP. 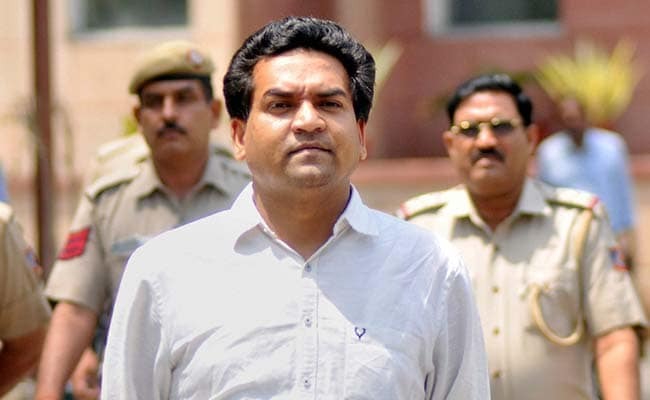 New Delhi: Taking on sacked Aam Aadmi Party minister Kapil Mishra, a Delhi-based businessman claimed on Thursday that he had donated Rs 2 crore to the Arvind Kejriwal-led party, instead of it being paid by a shell company, as Mr Mishra had alleged. Mr Sharma, a property dealer and tobacco trader, said he had donated the money through a demand draft on March 31, 2014. "The public support to the AAP at that time was over-whelming and I had donated the money to the party hoping that it will do good for Delhi and for the nation," he said. Mr Mishra had alleged "massive irregularities" in the funding of AAP and raised questions about the "suspicious" donation of Rs 2 crore. He had also claimed that several shell companies had given money to AAP and the party knew it. Asked what took him so long to claim that he donated the money, Mr Sharma said, "I was tired of the allegations that it was given by shell companies." He added that taxmen are probing him since last two-and-a-half years over the donation made to the party. A video clip of Mr Sharma's interview by a news channel was also re-tweeted by Chief Minister Arvind Kejriwal. Mr Mishra was suspended from the party last week, after he went public with allegations of corruption against Mr Kejriwal and claimed he had seen him receiving Rs 2 crore from another minister. He also alleged that the Chief Minister's brother-in-law had scored illegal land deals. Mr Kejriwal and AAP say Mr Mishra was sacked because of poor performance, and that his allegations are wild and baseless. A week ago, he started an indefinite hunger strike demanding that the AAP chief "reveal" the source of funding of foreign trips taken by five AAP leaders -- Sanjay Singh, Ashish Khetan, Raghav Chadhha, Satyendar Jain and Durgesh Pathak -- in the last two years. The fast ended when he fainted while speaking to the media on Sunday. He was taken to hospital, and released on Monday.